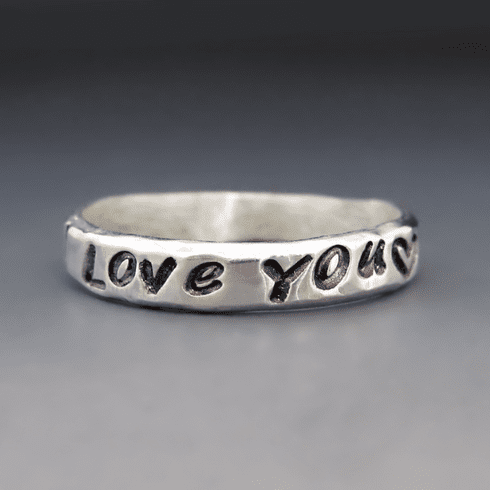 Give someone you love a constant reminder of how you feel with this sterling silver "I love you" ring. This ring can be worn alone or stacked with other rings. They are hand-molded and hammered to create a lovely organic shape and feel. When wearing several stacking rings, they will tend to fit tighter than your typical slim band. For comfort sake you may want to consider MOVING UP A HALF - TO A FULL SIZE from your normal ring size. The more rings you stack the tighter they will feel. This Sterling silver ring is given a hammered texture and polished. You choose from two different fonts: Perfect Pen and Typewriter (lowercase only).